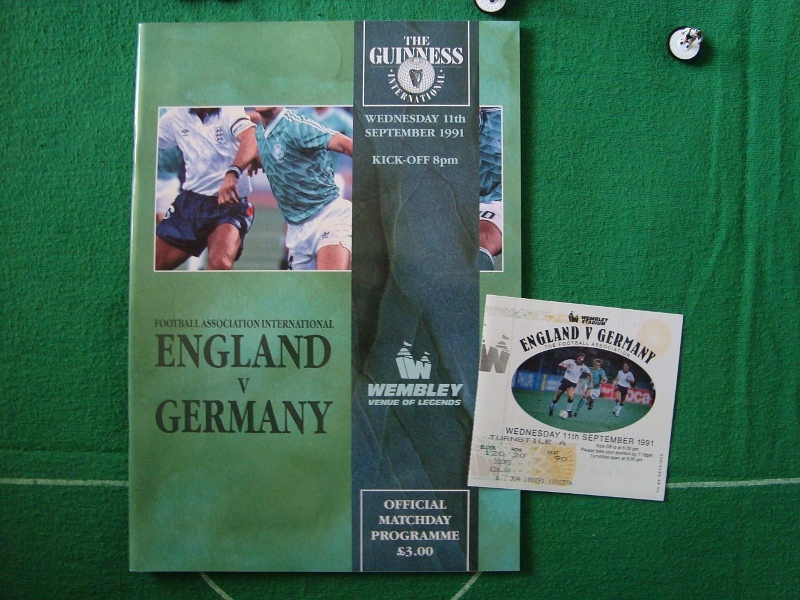 The official match programme for the 1991 friendly encounter between England and the then recently reunited Germany at Wembley is an A4-sized publication containing fifty-eight pages, and was priced at a fairly reasonable three pounds. The image on the cover is a selection of photographs taken during the World Cup semi-final played in Turin the previous year – identified through their squad numbers the players from left to right are Terry Butcher, Thomas Berthold and Lothar Matthäus. 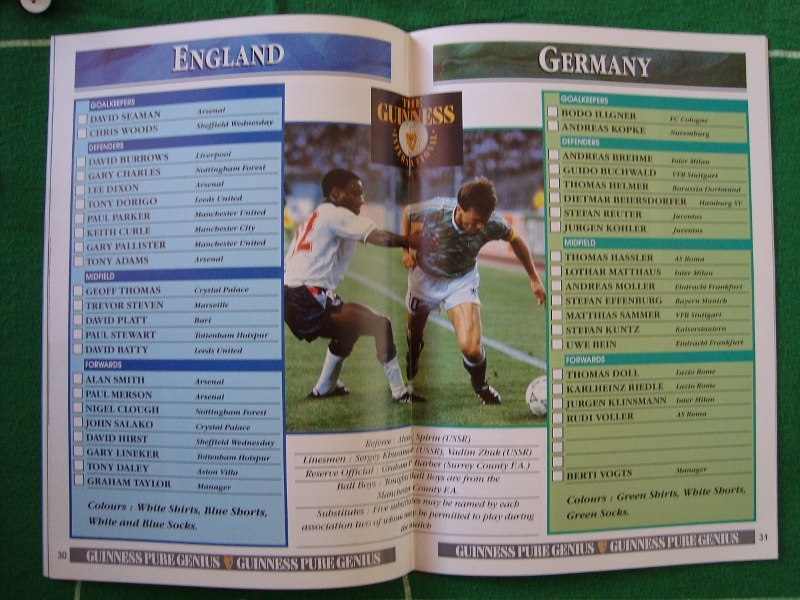 The programme contains most of the regular features – an overview of the games played between the two sides, player details and photographs of the memorable World Cup semi-final encounter in Turin. 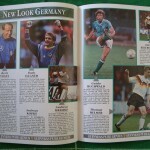 When the German squad arrived at Wembley in the late autumn of 1991 it was as a unified team; less than a year earlier the two Germanies had been recreated as one, the culmination of a tumultuous chain of events that had started in the winter of 1989 and the breaching of the Berlin wall. 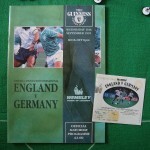 It would be Germany’s first fixture as an united country against the Three Lions since the controversial encounter in Berlin in 1938; Berti Vogts’ 1991 side would also be the first team representing all of Germany to visit England since White Hart Lane in 1935, and the first to play at Wembley. Following the Mannschaft’s World Cup victory the previous year in Rome, departing Nationaltrainer Franz Beckenbauer had predicted that together with the cream of the crop from the former GDR the German squad would be “unbeatable”; these fateful words would place a heavy burden on the shoulders of his successor Berti Vogts, who found himself having to live up to these expectations and more. 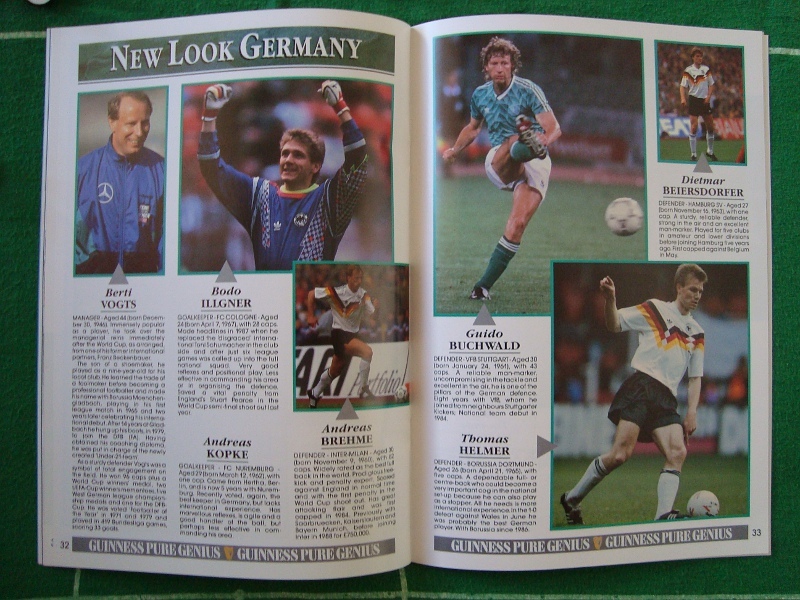 While there were a number of players from the six new Bundesländer who would go on to prove themselves in the Schwarz und Weiß, it would not be so simple as adding a few more decent players to what was already a world champion side to make an unbeatable one. Under their new Nationaltrainer Germany had played its first match as a unified country in December 1990 against Switzerland: the side featured only two players from the former East in Bayer Leverkusen’s new acquisition Andreas Thom and midfielder Matthias Sammer – now with VfB Stuttgart. Three more games were played between this first game and the Wembley fixture, and during this time only one further easterner took to the field: winger Thomas Doll, who had recently made the move from BSC Dynamo to Hamburger SV. Of the eleven that took to the field at Wembley, only Doll would feature during the course of the ninety minutes. The truth was that the much-vaunted “talent from the East” – Beckenbauer’s own words – was far thinner on the ground than Der Kaiser or anyone else had imagined; there were a number of genuine stars – Sammer being the brightest – but only a small handful of those who had played in the blue and white of the former GDR ever turned out in the Schwarz und Weiß at full international level. England had been in excellent form under Bobby Robson’s post-World Cup replacement Graham Taylor, coming into the game on the back of a twelve-match unbeaten run; Berti Vogts’ German side meanwhile were still smarting from what had been a shock 1-0 reverse in Cardiff against Wales in their third European Championship qualifier – their first competitive defeat since the semi-final of the 1988 European Championship. With Vogts’ side deprived of the services of the goalscoring legend Rudi Völler and sprightly defender Stefan Reuter, the home side were probably slight favourites as the two teams took to the field. Recently signed by Italian club SS Lazio after just the one season in Hamburg, Thomas Doll was selected to start ahead of the more experienced Jürgen Klinsmann, while blond Bayern München midfielder Stefan Effenberg was making his first start for the Nationalmannschaft; Doll would be partnered up front by his new Lazio team mate Karl-Heinz Riedle, while Reuter would be replaced by Eintracht Frankfurt’s more orthodox but arguably less versatile Manfred Binz. Sporting what would be an attractive one-off green version of the World Cup-winning “flag” shirt with white shorts and green socks, Berti Vogts’ side kicked off in front of a 59,493-strong crowd – me and 59,492 others. In what appeared to be an inadvertant nod back to 1966, taking charge of the match was Soviet referee Alexei Spirin – known to everyone in refereeing circles as “Aspirin”, according to Sky Sports commentator Martin Tyler – with two other officials from the Soviet Union running the lines. 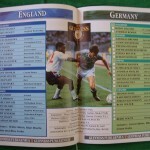 The opening moments were a little scrappy as the Soviet referee blew up for two free kicks within the first three minutes, but with just under four minutes on the clock Germany almost took the lead as Guido Buchwald’s header from an Andreas Möller corner grazed the outside of the right post with England ‘keeper Chris Woods beaten. The chance came about more through poor English defending rather than any great tactical positioning from the Germans; as the ball floated into the box all of the defenders stood like statues as the languid Buchwald was able to steal in behind them to get his head to the ball first. With just under ten minutes gone England almost took the lead against the run of play, as a Trevor Steven cross from the right was nudged forward by David Platt, finding Gary Lineker whose sharp turn and shot forced Bodo Illgner into a fine one-handed save diving to his right. Even then the danger was not over, as Effenberg was forced into sweeping the ball away off the line with Crystal Palace’s John Salako closing in. Less than three minutes later Effenberg was slightly less impressive as a mistimed backpass almost let in Lineker, who was foiled by the alert Jürgen Kohler. England were on top now, as Alan Smith’s sharp header from a Salako cross was excellently tipped over the bar by Illgner before Tony Dorigo launched a stinging drive that flew just high and wide of the left upright. With just over a quarter of the match gone a long ball found Lineker in space, only for him to be upended by Andreas Brehme. The tackle was late and one could argue that Brehme was the last man – the rule had only just been implemented – but much to his relief the German left-back was shown the yellow card. Brehme was quickly joined in Mr. Aspirin’s notebook by Kohler, with Lineker once again the victim of a late and clumsy challenge. Were the game not a friendly, either one of these two challenges could well have resulted a straight dismissal. With England looking sharper by the minute and the Germans looking increasingly shaky in defence, it looked as though it would only be a matter of time before the home side took the lead. The powerful German midfield had seen little of the ball; the likes of Lothar Matthäus, Andreas Möller and Thomas Häßler were conspicuous by their absence, while their England counterparts were continuing to make chances. With half an hour gone Graham Taylor’s side almost broke the deadlock as a John Salako corner was met by a rising David Platt, whose header crashed against the crossbar. Despite looking by far the better side over the first forty-five minutes, England would ultimately pay for not taking their chances a minute before the break. Picking up the ball just inside the England half, the otherwise anonymous Matthäus charged forward, finding Thomas Doll with a well-times pass that was threaded through the England defence. Beating the offside trap, Doll made his way to the byline, where he smartly two-stepped Salako before placing a left-footed cross into the box. By now the England defence were all over the place, and the completely unmarked Karl-Heinz Riedle took full advantage of the acres of empty space to coolly nod the ball past Woods and register his fourth international goal. After what had been a bright opening five minutes Germany had largely been outplayed for the other forty; when the half-time whistle blew Vogts’ side found themselves 1-0 up, but they could very easily have been two or three down. The second half started slowly, with Germany retaining possession much to the chagrin of the home crowd. Much like in the first half, England sparked into life six minutes in, as Bodo Illgner was forced into yet another stunning save. A loose ball had been picked up just outside the German box by fullback Lee Dixon, whose crashing drive took a wicked deflection off Andreas Brehme before Illgner acrobatically turned it up and over the bar. As the game approached the hour mark, Chris Woods in the England goal was finally called upon to make a save – one that almost certainly kept his side in the match. After a neat buildup down the left Andreas Brehme curled in one of his trademark left-footed crosses, finding Riedle in space at the far post. The striker met the ball firmly, only for Woods to pull off a magnificent block. The game was now starting to open up: Illgner was perfectly positioned to collect a weak but on-target Platt header, while the Germans were starting to find more creative space in midfield. With sixty-seven minutes gone Salako and Steven were replaced by debutants Paul Stewart and Paul Merson. Spurs midfielder Stewart was almost immediately in the thick of the action, setting up Platt whose right-footed effort brought another fine save from the impressive Illgner in the German goal; less than two minutes later, Chris Woods was being tested at the other end as Matthäus was on target with a crisp shot from distance. Thomas Doll then found sweeper Manfred Binz whose shot flew narrowly over the bar, while Illgner punched away a Dorigo cross and held yet another well-directed shot from Merson. With nine minutes to go Jürgen Klinsmann came on for the impressive Doll, and as the full-time approached Germany calmly closed in on yet another win at Wembley. Graham Taylor’s impressive unbeaten start as England coach would come to an end, and Germany would go into their return Euro qualifier against Wales with renewed confidence. Buoyed further by the return of a fit-again Rudi Völler, the Mannschaft would brush the Welsh aside in Nürnberg, and in doing so regain the initiative in the group and set them back on the path to qualification. Both Germany and England would successfully qualify for the finals in Sweden, though any hope of the two teams meeting in the tournament would be scotched by England’s disappointing elimination at the group stage as Germany reached the final. Their next chapter of this classic fixture would be in 1993 in the four-team US Cup – something of a landmark as it would see the first full international played by either side in a covered indoor stadium, Detroit’s Pontiac Silverdome. Home: played 11, won 3, drawn 3, lost 5. Goals for 16, goals against 25. Away: played 9, won 3, drawn 0, lost 6. Goals for 9, goals against 24. Neutral: played 4, won 2, drawn 1, lost 1. Goals for 4, goals against 6. Overall: played 24, won 8, drawn 4, lost 12. Goals for 29, goals against 55.